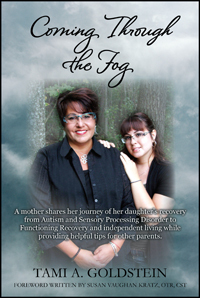 A mother tells the journey of her daughter's recovery from Autism and Sensory Processing Disorder to Functioning Recovery and independent living, giving tips to parents on how to navigate the medical and educational domain. This story is an example of the unique obstacles facing a parent raising a child with Autism. The challenges they face getting supports. What is Sensory Processing Disorder, CranioSacral Therapy and Bio-Medical Therapy, and what roles they play on the road to Functioning Recovery and independent living? See actual projective trials pertaining to sensory supports. Is educational discrimination the reason there is difficulty getting help in school? As this story unfolds it provides useful tips to other parents to help them on their journey with their child. This story is notable because this mother's daughter was successful overcoming numerous obstacles while providing useful tools, inspiration and hope to others. This journey begins with a mother’s love for her daughter. After learning her daughter was on the Autism Spectrum Tami began to tirelessly educate herself in the sciences of: Behavioral Health, Child Psychology, Human Anatomy, Occupational Health, Pharmacology and Therapeutic Massage and Bodywork and has been a parent advocate for her daughter since 1997. In 2002, as her knowledge and passion grew, Tami began reaching out to other families in need of help. In 2005, Tami founded the Rock County Autism Support Group and she is the community resource liaison for the SPD (Sensory Processing Disorders) Parent Connections Support Group of Rock County and the surrounding areas. Since 2005, Tami has been State and National Certified in Therapeutic Massage and Bodywork and in 2013 she certified in CranioSacral Therapy with the Upledger Institute in Florida. Tami currently has two offices where she facilitates CranioSacral Therapy. Approximately 38% of her clientele are children, teenagers and young adults on the Autism Spectrum or with other neuro-developmental delays. When asked to lecture, Tami uses her personal experience, extensive knowledge, and dedication to help others learn about and understand the medical and educational aspects of Autism, Autism Spectrum Disorders and SPD.